Tips for Minimizing Halloween Sugar Overload! 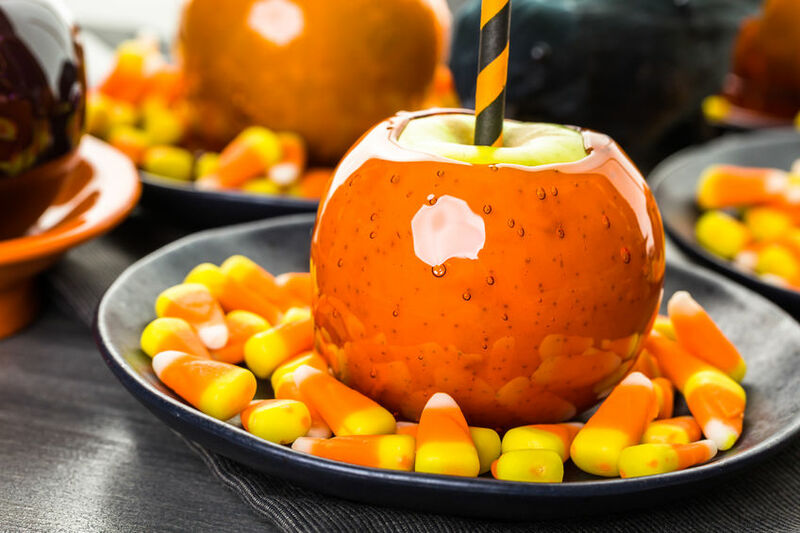 Halloween is just around the corner and just because candy is involved, doesn’t mean that you have to over-indulge OR completely deprive yourself! Mindset is a key component to success when approaching ANY tempting situation. If you tell yourself that you can’t have something…chances are…that is ALL you will be thinking about. If you completely deprive yourself, you’re more likely to lose all self control when you finally give in and have “just a taste.” At least that’s what happens with me. Here are some tips to set you and your family up for success this Halloween. It’s much easier to resist sugar when you’re actually satisfied. We often reach for sugar-laden foods when we’re tired as a quick “pick-me-up.” The problem is that as quickly as it lifts your energy levels, it drops them sending you back to that candy jar. Before you know it you’ve had 5 fun-sized snickers. That “fun” doesn’t seem so grand 400 calories later when you’re still hungry. Instead, fill up on protein and veggies during the day to maintain stable energy and blood sugar levels. Make sure your children have a hearty, balanced dinner with lean protein, healthy fats and plenty of veggies before trick-or-treating. Do you have a favorite Halloween candy? If you couldn’t tell from the tip above, mine are Snickers bars. I don’t deprive myself of the snickers. Instead, I decide that it is worth having so I’m not going to waste empty calories and tons of sugar on candies that I don’t like such as Almond Joy or Kit Kat Bars. (My apologizes to those of you who like those. If that’s your thing, great, savor them…and save the Snickers for me.) Make sure that you make wise food choice throughout the day and then chose what you really enjoy. Have 1-2 pieces (ok maybe 2-3) and leave it at that. Make it WORTH IT. Are you going to a Holiday Party? Bring some healthy options to balance out the treats. Homemade “mummy pizzas” on whole grain flat breads or English muffins. Arrange thin slices of cheese as though it were mummy cloth over low-sugar marinara sauce. Serve with baby carrots. Feel free to cut “finger nails” with a potato peeler into the carrots for a festive touch. After Halloween, sort through and throw out the stuff you don’t like. It’s not worth eating just because it’s there. Next, put the candy in a candy jar or closet so that isn’t in your line of vision whenever you walk into the kitchen. Allow yourself and/or your kiddos to enjoy 1 piece of something you truly like after eating a balanced meal and leave the rest in the jar. I hope that you feel more empowered this Halloween. As long as you’re getting regular exercise and eating well most of the time, a little treat isn’t going to break the bank. Enjoy the other elements of Halloween such as the fun costumes, parties, and fellowship with friends. Let the candy be a nice bonus at the end.